The Cahill & Perry, P.C. law firm has been an advocate for railroad workers and their families for over 30 years, with a tradition of providing quality personalized legal representation for injury victims. Cahill & Perry have handled many important railroad injury cases and has generated over a hundred million dollars of awards for its clients. Our attorneys are skilled and experienced in all aspects of railroad injury law and have obtained precedent setting awards for clients in jurisdictions throughout the United States. 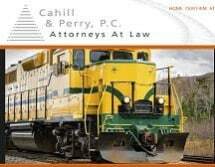 At the Cahill & Perry railroad law firm we believe in rail labor and in giving back to the cause of railroad workers who have put their faith in us. Over the past three decades we have always been ready to help rail labor level the playing field when battling against rail management.